What are the most popular online bachelor's degrees offered in Colorado? Colorado is one of 16 states in the Western Interstate Commission for Higher Education (WICHE), an institution created to extend and improve educational access for students. Residents of Colorado and other WICHE states are eligible for reduced tuition and state reciprocity agreements that allow students to pursue educational programs offered outside their home state. Accredited programs are reviewed and approved by the Colorado Commission on Higher Education. With more than 60 online colleges in Colorado—including multi-district, single district, and charter schools—students can find a variety of educational opportunities. Like most states, Colorado works to augment local higher education options. With hundreds of thousands of residents seeking accredited degrees, the state has strived to make college more accessible. Between 2006 and 2011, public four-year colleges and universities in Colorado reported a 23.6 percent increase in enrollment, partially due to an increase in the availability of distance programs. At the same time, tuition has risen steadily while state appropriations have dropped. The climate has encouraged many Colorado residents to pursue their degree online, where school tends to be more affordable. While online and distance learning programs are often available nationwide, in-state online programs may offer reduced tuition and improved access to resources. In some programs, students may have the option of taking courses both online and residentially. Regis, one of 28 Jesuit Colleges throughout the United States, welcomes students of all faiths to apply. First established in Las Vegas, the institution moved to Denver in 1887. Online learners can choose from 30 different bachelor’s programs, including studies in criminology, finance, or computer networking. Two dual degrees offered as BS/MS programs are available in nursing education and nursing management. Both programs require students to earn 150–153 semester hours. Students should plan to spend around 15-20 hours per week on each class. Students complete an orientation course to familiarize themselves with the learning management system, registration process, communication methods, and how to use Dropbox. Regis offers online certificates and licensures, graduate, and doctorate programs at an accelerated pace. Online resources include library access, through which students can explore Regis’ many databases. Many online programs are offered in a hybrid format. Regis’ flexibility makes it one of the best online colleges in Colorado. CSU-Fort Collins offers eight fully online undergraduate degrees in disciplines such as agricultural business, anthropology, and human development and family studies. CCU’s nearly 40 fully online master’s programs include studies in agricultural science, business, computer science, and engineering. Students can also pursue fully online doctoral programs in higher education leadership and systems engineering. Finally, CCU offers several graduate and doctoral business and education degrees as hybrid programs. Admissions requirements vary by program, but as a general rule all undergraduate candidates need a high school diploma or its equivalent and transcripts featuring a cumulative GPA of at least a 2.0. Certain majors require prerequisite courses. Candidates seeking graduate admission need a bachelor’s degree and corresponding official transcripts. The Anschutz Medical Campus of CU Denver offers online degrees focused on disciplines other than the health professions, making it one of the best online schools in Colorado. For instance, students pursue bachelor’s degrees in communication, English writing, public service, and human development and family relations. Master’s programs include curriculum and instruction, early childhood education, school library sciences, and business administration. The university also offers online or hybrid doctorates in education, nursing practice, and nursing. Most bachelor’s programs consist of 120 credits and take students four years to complete. The majority of master’s programs consist of 30 credits with varying completion times. Generally, candidates for admission excel in academics and standardized examinations. The average admitted undergraduate enters CU Denver with a high school GPA of at least a 3.3. All applicants submit official transcripts with their applications. CSU-Global was the first independent, entirely online, fully accredited state university in the country. Students select from 13 different bachelor’s programs, including accounting, business, organizational leadership, and project management. The university provides degrees and services to support veterans and active military members seeking online learning options. Being a part of the Colorado State University system gives students access to over 200,000 peers worldwide. CSU-Global is one of the only online colleges in Colorado to offer classes in an eight-week accelerated format. The school has monthly start-dates. CSU-Global uses Schoology as its learning management system. During business hours, students can contact CSU-Global faculty by phone, email, and webform. Distance learners are provided with services including tutoring services; access to CSU’s online library, and career center help. Online students regularly interact with their instructors and peers. Students can add a certificate to any degree studies. Founded only a few years after the city itself, Denver has conferred degrees since 1864. DU is a private school that serves approximately 12,000 students and is one of the best online colleges in Colorado. The Carnegie Foundation classifies the school as a research university. Online students are encouraged to participate in research projects that take place across departments at the university. Online bachelor’s programs at DU include communication arts, global studies, environmental studies, and global commerce and transportation. Courses are delivered through the College of Professional and Continuing Studies. Online courses use discussion boards and audio and visual formats to teach course material. The school offers certificate and master’s programs. Online certificates include security management, strategic human recourses, and geographic information systems. Online programs are taught asynchronously, but DU recommends that distance learners log-on at least once a day. Courses are delivered through Canvas and are taught on a ten-week, quarter schedule. The university was created in 1889 by the governor of Colorado to provide training for public school teachers. It transitioned to an institution offering liberal arts degrees in 1970. UNC offers over 200 degree programs to its online students. 33% of the recipients for the Colorado Department of Education’s Teacher of the Year Award attended UNC. The school was awarded the Community Engagement Classification by the Carnegie Foundation. This award is given to schools who are highly-invested in their communities through field-based learning, internships, and practicum. Online degree options currently comprise seven different bachelor’s degrees, with options in teaching, programs in ASL and interpreting, dietetics, sociology, nursing, psychology, and more. The school has been providing online programs for nearly two decades. The university is well-recognized among online colleges in colorado. Licensures, certificates, endorsements, master’s, and doctorate programs are offered online. CTU incorporates asynchronous course delivery into its 130 associate, bachelor’s, master’s, and doctoral programs to make it easy for busy students to earn their degree. Notable bachelor’s programs include business administration with focuses in healthcare management, business management, marketing, and organizational behavior. Other bachelor’s degrees include electrical engineering, project management, and psychology. Master’s programs feature studies in business administration, computer science, criminal justice, and management. The school also has doctorates in business administration and management available to students. CTU grants credit for prior academic, professional, and life experience. Because admissions requirements vary by program, the school offers admissions advisors who guide students through the application process. Generally, undergraduate applicants possess a high school diploma and graduate candidates hold a bachelor’s degree. Colorado Christian, formed as the flagship Christian university in the state, is located in Lakewood and was founded in 1914. The private university has a student body under 7,500 and is one of the online colleges in Colorado accredited by the Council for Christian Colleges and Universities. The College of Adult and Graduate Studies supervises CCU’s online degree offerings, which includes 17 bachelor’s degrees. Undergraduate degrees include biblical studies, business administration, early childhood education, and human resource management. Colorado Christian offers associate, master’s, graduate certificates, and post-baccalaureate licensing online. The school uses Blackboard for its online programs. Enrollment dates are available every semester. Depending on the program, courses will last 5–10 weeks. Instructors are available through email. Distance learners can transfer up to 90 credits and CCU offers credit for prior learning experiences. CCU is non-denominational and unites with the broad, evangelical faith. Located in Grand Junction, Colorado, Mesa University is a public institution providing degrees rooted in the liberal arts, professional, and technical fields to nearly 11,000 students annually. The majority (77%) of all students are traditional-aged learners enrolled in full-time study; many working adults attend the online school by CSU. Mesa, one of the best online colleges in Colorado, focuses on innovative, career-focused programs taught by engaging and qualified professors. Four fully online bachelor’s degrees are available, including studies in sports management and liberal arts with elementary education licensure. Two degree completion programs are available: an RN to BSN program and a BAS in Radiologic Technology. Students use the Desire2Learn course management platform. Most classes are asynchronous, but some courses require students to log-in for live electronic classroom meetings. Student resources include library and database access. Distance learners must apply online for an MAVcard before being allowed access. Located at the foot of the Austin Bluffs in Colorado Springs, UCCS is one of the four online colleges in Colorado comprising the University of Colorado system. With the purchase of 80 acres for $1, generously made available by a local businessman, UCCS opened its doors in 1965 and is the fasted growing of all the UC schools. The university offers more than 70 degrees ranging from baccalaureate to doctoral, including six fully online bachelor’s offerings in areas of business, communication, criminal justice, health care sciences, and sociology. UCCS offers an RN to BSN degree completion program. Online orientations are available to provide info on using the online learning platform, taking part in student organizations, and receiving support and assistance from various campus resources. Classes are taught through Blackboard. Online student resources include access to the writing center and library. The library provides online guides, video tutorials on how to effectively use its resources, database access, and more. Our affordability methodology considers value-driven metrics and ranks schools that have low tuition rates, as well as proven graduation rates and employment outcomes that provide a high ROI for students. For students in Colorado, there are plenty of opportunities to find an affordable program locally. While distance education provides more flexibility than an exclusively residential curriculum, there are still plenty of advantages to attending a local online college, including access to lower tuition prices and local scholarships. If you're considering going back to school, and are thinking about studying online, the following list of cheap accredited online colleges in Colorado will help you start your search. The University of Denver is the oldest independent institution in the Rocky Mountains. The school offers undergraduate and graduate degrees online through its University College-College Of Professional And Continuing Studies. University College has grown into DU’s second-largest academic unit. The school designed its online programs to fit the busy schedules of working adults. Courses are taken in an asynchronous format. Most undergraduate degrees are degree completion programs. Web-based courses follow the school's traditional, ten-week schedule. Students typically take two classes per semester, and professors expect them to log on at regular intervals. The school is among the colleges in Colorado to offer Bachelor's programs in global studies, environmental studies, and information technology. Colorado State’s virtual campus, CSU Global, offers more than a dozen undergraduate degrees, largely in career oriented fields like criminal justice, communications, accounting business management, IT, and healthcare. CSU Global also offers master's degrees. CSU Global boasts monthly term starts, so students can start their program at their convenience. Courses are taught on an accelerated eight-week schedule. The university offers every class asynchronously every trimester, so programs work with your busy schedule, and you don't have to wait to take required classes. The average student transfers 59 credits into their program. CSU guarantees low, fixed-rate tuition, making it one of the most affordable online colleges in Colorado. Regis, a Jesuit university located in Denver, offers almost as many programs through its web campus, WorldClass, as it does on campus. Students can select from 78 undergraduate, master’s, and certificate programs in critical care, anthropology, software engineering, business administration, the liberal arts, and more. Regis schedules WorldClass courses in a standard semester format, and in accelerated eight-week sessions. Most professors run classes asynchronously. Students should set aside 15-20 hours per week, per course. Regis accepts up to 90 transfer credits. World Class hosts a sample course online to give distance learners a feel for its format. UCCS was an early adopter of web-based education, as the school has offered fully online degrees since 1996. UCCS Online offers seven bachelor’s programs and thirteen master’s in business, nursing, health care, criminal justice, education, engineering, communication, sociology, and public administration. Distance learners receive a reduced tuition, making the school one of the most affordable online colleges in Colorado. UCCS conducts most classes in an asynchronous format to accommodate the schedules of working professionals. Some classes have real-time components. The university allows the application of up to 90 transfer credits towards a degree. Students can earn credit by passing prior-learning exams. Each program has its own online requirements. Adams State, located in Alamosa, is a state-supported university with an active virtual campus run by its Department of Distance Education. The school offers an array of programs entirely online, including an associate in general studies and business; undergraduate degrees in business, sociology, and interdisciplinary studies; and a master’s in education. Concentrations in areas like criminal justice, accounting, and English allow students to specialize their studies. Sections of the distance education site have provisions for students without internet access. The school schedules most online classes asynchronously. Learners can accrue credits by taking the school's prior learning assessment test. ASU’s four-year tuition guarantee does not apply to distance students, but the university’s low rates keep it among the most affordable online colleges in Colorado. The University of Northern Colorado began offering distance education in 1902, and the school was one of the first to offer web-based classes in the late 1990s. The Greeley-based institution now hosts sixteen online and hybrid degrees in a range of disciplines through its UNC Online department. The university designed its programs for working professionals. Most classes are taught asynchronously. UNC follows the standards of Quality Matters, the internet standard bearer, to ensure its cyber classes are of the highest caliber. UNC is among colleges in Colorado to use the Canvas platform to administer online classes. The Higher Learning Commission accredits the school's programs. Online courses follow the traditional semester schedule, and students can typically begin any term. Students have the opportunity to complete many programs with a year of study. CSU-Pueblo, one of the three universities in the Colorado State system, offers two online degrees – a bachelor of science in construction management and an online master’s in business administration. CSU runs both concurrently with their on-campus counterparts. Professors in both programs generally teach their classes asynchronously. CSU-Pueblo schedules its online classes in eight and 16-week sessions, with six start dates per year. By taking two classes per session, students can complete their MBA in a year. The construction management BA usually takes two to four years to complete, depending upon the number of classes taken per term. CSU-Pueblo locks its tuition fees, making it one of the most affordable online colleges in Colorado. Colorado Mesa University, located in Grand Junction, hosts an array of online classes through its Department of Distance Education. The school also offers five degrees entirely online, including an associate in social science and bachelor’s in radiology, nursing, sports management, and the liberal arts, which has an elementary education focus. Colorado Mesa's online classes fall into three categories: asynchronous, hybrid, and web-enhanced instruction, which require students to attend real-time classes through their computers. The goal of each class is to meet Quality Matters’ standards. The university welcomes distance learners from all states, except Massachusetts and Florida. Some online students qualify for tuition discounts. Colorado Christian, an interdenominational university based in Lakewood, now offers almost every program in its College of Adult and Graduate Studies entirely online. Distance learners can select from dozens of degrees at the associate, bachelor’s, and master’s levels. CCU is open to all students, but conducts classes from a Christian perspective. CCU’s web-based classes run asynchronously on a block system each semester. The university employs a “community model” for its courses, and students focus on one class at a time. Colorado Christian awards credit for work experience with its prior-learning credit program, making it one of the more affordable online colleges in Colorado. JWU-Denver, one of four Johnson and Wales campuses, provides students with access to the system’s digital campus. The university offered its first fully online degree in 2010 and has since expanded to offer twenty undergraduate and graduate programs. These degrees emphasize hands-on learning, offering pragmatic, career-oriented instruction that distance learners can take into the workforce. JWU schedules its classes asynchronously in 11-week terms, with four start dates per year, and uses its own ulearn software that is built on the Blackboard platform. Students can earn credit for work experience with the prior learning tool. The university hosts an online open house to give prospective students a look at its methods. There are 55 different colleges in Colorado offering some form of higher education online. These range from associate degrees and isolated course offerings to doctoral degree programs. According to anNCES report from 2012, 75% of online students are undergraduates and, surprisingly, over half of distance learners live outside of Colorado. With access to in-state tuition, online students from all over the country can get a great education at an affordable price from an online college in Colorado. Nearly 20% of postsecondary students in Colorado are enrolled in exclusively online programs. 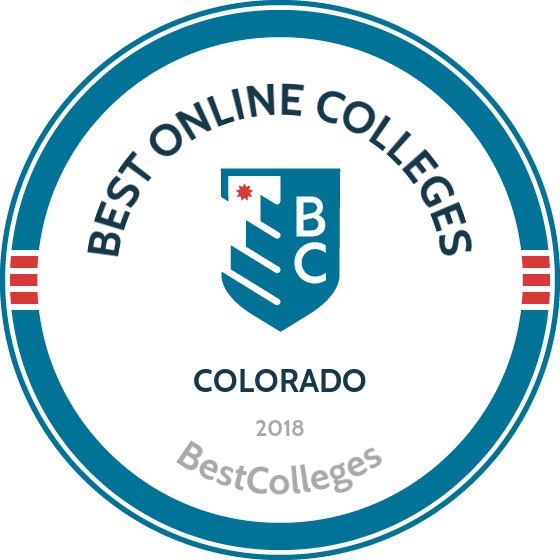 Browse our list of the best online colleges in Colorado for more insight into distance learning programs in this state. Online schools help students earn the degree or certification they need to advance their careers, without disrupting their professional or personal lives. Colorado's online schools offer working professionals a top education and many charge distance learners lower tuition rates than residential students. The affordability and convenience of online education have made web programs more popular in recent years, as students feel increasingly comfortable pursuing their degree online. Employment growth in this profession in Colorado is strong. According to the Colorado Department of Labor and Employment, long term projections show an increase of 34% in the total number of jobs between 2014 and 2024. Wages increased by 11% from 2011-2016. In Colorado, what were the top careers in 2016 for people who had a degree in business administration and management? Data source: Colorado Department of Labor and Employment, Bureau of Labor Statistics. Data may not be available for every year. Employment growth in this profession is strong in Colorado. According to the Colorado Department of Labor and Employment, long term projections show an increase of 34% in the total number of jobs between 2014 and 2024. Wages increased by 2% from 2011-2016. In Colorado, what were the top careers in 2016 for people who had a degree in registered nursing? Employment growth in this profession is strong in Colorado. According to the Colorado Department of Labor and Employment, long term projections show an increase of 42% in the total number of jobs between 2014 and 2024. Wages increased by 16% from 2011-2016. In Colorado, what were the top careers in 2016 for people who had a degree in health care administration/management? Employment growth in this profession is strong in Colorado. According to the Colorado Department of Labor and Employment, long term projections show an increase of 44% in the total number of jobs between 2014 and 2024. Wages increased by 7% from 2011-2016. In Colorado, what were the top careers in 2016 for people who had a degree in accounting? Employment growth in this profession is strong in Colorado. According to the Colorado Department of Labor and Employment, long term projections show an increase of 29% in the total number of jobs between 2014 and 2024. Wages increased by 5% from 2011-2016. In Colorado, what were the top careers in 2016 for people who had a degree in human resources management/personnel administration?